The city of Durban added another feather to its cap, since climbing to second place as Africa’s busiest business tourism and events destination in 2013. 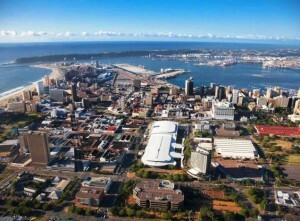 This came after ICCA (International Congress and Convention Association) released the statistics in May this year highlighting that Durban had significantly improved its rankings on the continent. In the latest rankings Durban has moved up 60 places to the 97th spot, which is a momentous progression, and continues the improvement achieved over the last three years. In 2011, Durban was ranked 173rd in the world and moved up to 157th place in 2012. ICCA is a not-for-profit trade organisation whose primary purpose is to be the global community for the meetings industry, enabling its members to generate and maintain significant competitive advantage. It has almost 1000 members in over 90 different countries. The Durban International Convention Centre continues to act as a catalyst for the economic wellbeing of the tourism industry in the city and region. The centre has been the trailblazer for the growth of the conferencing, meetings and exhibitions industry in South Africa since its inception. “This incredible improvement in rank can be ascribed to the commitment of the Durban KZN Convention Bureau’s efforts in securing events and streamlining the collation process of qualifying information and the submission to ICCA”, said an overjoyed Mabuyakhulu. The city held 25 meetings which allowed the Durban ICC to play host to majority of the conferences. These meetings are accredited by ICCA and rotate between three countries and attract at least of 50 participants. Sadha Naidoo, chairman of the Tourism KwaZulu-Natal board further explained that through the securing of major business events such as the World Association of Co-operative Education, the 6th Multilateral Initiative on Malaria Pan African Conference and the African Organization for Research and Training in Cancer (AORTIC), the city’s position is being entrenched.